The Rock Shelters of Bhimbetka are a repository of rock paintings within natural rock shelters with archaeological evidences of habitation and lithic industry, from the Palaeolithic and Mesolithic periods through the Chalcolithic to the Mediaeval period. They are located within the designated Ratapani Wildlife Sanctuary, in an area of abundant natural resources and shelter. The shelters exhibit the earliest traces of human life in India, its rock paintings are among the world's oldest. The inscribed area consists of 5 clusters (5 hills) of in total ca. 400 shelters. 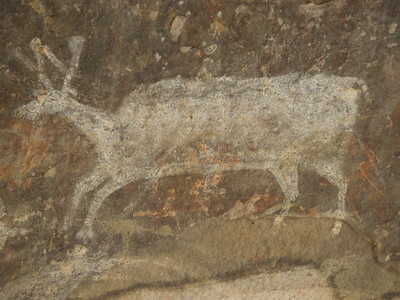 The paintings, largely in white and red, show the varied animal life which shared the forest environment with the prehistoric people, and of the various facets - economic and social - of the peoples' lives. Later more elaborate paintings such as large processions of men on horses and elephants, battle scenes depicting spears, bows, arrows, shields and swords were added. Some of the paintings are superimpositions. The site was proposed as a cultural landscape, as it shows the cultural evolution in this microcosm from the Palaeolithic to the Medieval Period. 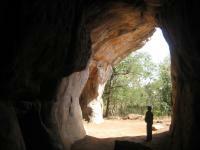 The Rock Shelters of Bhimbetka were discovered by V.S. Wakankar in 1957. Archaeological findings from excavations in the 1970s and 1980s include knives, hand axes, chopper tools and floors. It is no wonder that prehistoric people choose to live at exactly this location: Bhimbetka hill has massive sculpted rock formations that bring shelter from sun and rain. They were carved through wind erosions. The people used the natural caves to live in, while the rock paintings that remain visible are in half-open shelters. The more recent paintings were made at the same shelters as the older ones (they did not use a “clean sheet”). Sometimes they are even several layers of superimpositions of paintings from different periods. The colours of the paintings are white, red, green and yellow. The white ones are the oldest. At “Zoo Rock” a whole bunch of animals known to the locals are depicted. The red paintings are of a more recent date: they show horses which are non-native to India. And also the use of bow and arrow. Other notable rock art includes a large Bison with a small man running away from it, an early geometrical depiction of a horse & and a very elegant later one, and a drummer with dancers. And there it is again: the image of a human hand! (only one here). Some yellow and green paintings are also visible. They date from the 3rd century AD. Only a small part of the site is open to visitors. A signposted pathway leads you along about 15 rock shelters with paintings. I spent about an hour at the site. It is relatively low-key though nowadays you will have to pay the 250rs entrance fee that is collected at every Indian WHS from foreign visitors. The nomination dossier includes an “Urgent” Note from the ASI to Unesco, trying to reason away the reasons for Deferral that were given by ICOMOS. The discussion centred on the site’s proposal as a cultural landscape, is it relict or continuing? “Unlike the Aborigines of Australia, the adivasis are not ‘segregated’ communities whose ‘rights need to be protected’. They are no descendants of ancient Bhimbetka and painting at the site does not go on”, stated the ASI. Convincing enough probably, as the ICOMOS evaluation was overruled by the WHC in the same year. I visited this WHS in November 2016. After a long drive from Aurangabad we decided to stop at a convenient village on the way to Bhopal so as to visit the Rock Shelters first thing in the morning on our way to Bhopal (instead of going to and fro from Bhopal). 600 metres above sea level and 100 metres above the surrounding valley lie the craggy sandstone formations of Bhimbetka amidst the Ratapani Wildlife Sanctuary. There are over 700 rock shelters with more than 400 of them having paintings. 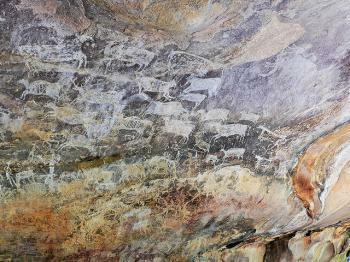 This makes Bhimbetka the largest repository of prehistoric art in India if not the whole of Asia. The most striking thing about the paintings here is their superimposition over time. The paintings are mainly in red and white but there is also the occasional use of green and yellow with themes taken from everyday events such as hunting. Entrance to the shelters costs only 100 rupees per person for foreigners + 250 rupees per vehichle if you want to avoid the rather uphill and desolate 2km walk to the site proper. It is the only WH site in India which still does not provide visitors with a new ASI printed ticket with a QR code but still relies on a handwritten one with government carbon copy (hence the cheaper price perhaps) which is clearly an indication of the few foreign visitors to this site. Although I have visited several rock art WHS worldwide, I really enjoyed Bhimbetka as I could (still) experience the original paintings and apart from the famous Zoo Rock Shelter some other rock shelters required crawling, climbing and laying down on the floor to appreciate. Some of the minor rock shelters seem almost 'undiscovered' and a bit of effort will certainly satisfy you curiosity. That said, if you read up before hand, it will be quite difficult to spend more than 2 hours to take in the rock shelters which are accessible to the public. The Zoo Rock Shelter (picture) is the obvious highlight with 453 figures of different animals + 90 human figures and symbols. Most of them are from the Chalolithic but a few of them are from the Mesolithic period. There are as many as 10 layers of superimposed figures here. My personal favourite though was the mythical boar/ox figure chasing a frightened hunter as it introduces the element of movement. There are several similarities with the Levantine Rock Art sites I visited in Spain as part of the Rock Art of the Mediterranean Basin not only with regards to the paintings and the materials used but also with other findings such as cup marks, utensils, mixtures used, etc. There are (or were?) plans to build a visitor centre here but perhaps it won't add much to the experience. I felt there were enough information boards and there is also a brand new brass UNESCO inscription plaque just before the first rock shelters. Its has been a wonderful experience for me to visit Bhaimbetka. Previously I was not even aware of such a place. It was only recently that I visited Madhya Pradesh and got a wonderful chance to witness the cradle of human history. The paintings are not very much visible to naked eye. So a professional guide is a must to understand the paintings. I am not going to bore you with my explanations. Visit it yourself and you will understand what I am talking about!!! A BIG THANK YOU TO MP TOURISM FOR ALLOWING US TO WITNESS HISTORY THAT TO IN SUCH MINIMUM ENTRANCE FEE. IT IS INDEED A TREAT TO WATCH OUT FOR!! Bhimbetka is a beautiful and peaceful site. We [UNIVERSITY OF HYDERABAD Students and my professors]visit this site in 2009. I feel very happy. Its stone age rock paintings are approximately 9,000 years old, making them among the worlds oldest. The paintings also describes about various routine activites of the day. and It was so beautiful place ,Bhim Betka is located in dense forest or Rata Pani wildlife reserve . Natural beauty is on peak , superb caves, rock paintings, temple. would like to visit again & again. We had the good fortune to visit Bhimbetka while on a 4 day visit to Bhopal and surrounding areas, had never seen anything as amazing and ancient. The entire area is incredible, one cannot beleive it is actually there, even when one is standing amidst the rocks and the painting. An everlasting and admirable memory of this awesome sight. Bhimbetka is an ideal location to view rock paintings of mesolithic man.People really interested in this part of history ,when visiting bhimbetka , must also visit places around this region where also more such specimens are available within Raisen district. Its worth it . An hour’s drive, south of Bhopal in the Vindhyan Mountains are the 600 rock shelters of Bhimbetka. It’s a peaceful and beautiful area and the natural rock formations – massive sandstone outcrops – must once have been a great place for Stone Age people to live in. The overhanging rock ledges gave them shelter and the forest was full of water and edible plants and fruits. The rock shelters has been painted from the Mesolithic period right through to the Historical period with different motifs, depicting time and life as it once was, 12.000 years ago. It’s a virtual pre-historic panorama of India, filled with hunting and battle scenes and all kinds of animals such as deer’s, buffalos, rhinoceros, bears and tigers. Bimbetka is a beautiful area to wander around for an hour or two and definitely not a crowded site. At the time of my visit there was not even an entrance fee charged and less than 10 people on site. Bimbetka is definitely worth a couple of hour’s excursion out of busy Bhopal. Bhim Betka is having detailed pictures of hunting and gathering community. the paintings also describes about various routine activities of the day. the site is very beautiful and is a good site for ornithologists. The continuous forest from Bhimbetka to Ratapani Wild Life Sanctuary provides an opportunity for trekking. There are numerous rock climbing sites. through the forest in the Sanctuary area we can also see the Old Fort of the Gond Tribes. Overall a good site to visit. Bhimbetka is a very unassuming site. It is located about 30 kilometers from Bhopal and connected by road. The rock formations are very interesting. One can actually see typical paintings on the wall by stone age people. Bhimbetka derives it name from Bhim-betka implying the seating place of Bhim, a legend from the epic Mahabharata. It is said that he stayed at this place, and used to sit on the stones, while he was exiled to the forest for a few years.